In order to meet the challenges of funding professional optical instruments, Perfex is able to offer you long-term rental solutions. Thanks to them, you have the ability to access up-to-date technological equipment while simplifying their renewal. You thus enjoy high performance equipments, a total cost control and a simplified equipment management. This flexible solution will allow you to invest according to your needs and reduce the impact on your cash flow. Investing regularly to stay competitive is paramount to any business, and it represents a cost. Long-term leasing is becoming a necessary alternative as it preserves your ability to borrow from your banks, since it is an "off-balance sheet" operation. Indeed, unlike purchased goods, the leased goods remain the property of the lessor. Thus, the equity / total balance sheet ratio is not impacted by this entry. Ultimately, you benefit from state-of-the-art equipment without degrading your balance sheet structure. Leasing technology assets is a great opportunity. Why ? You opt for an installation where you have analyzed the profitability beforehand. You will pay your rents for the use of competitive equipment. This allows you to expand your growth and development opportunities by investing more and better. In addition to this, planning your expenses: when you sign the contract, you know the amount, the duration and the periodicity of your due dates. By purchasing your equipment, you limit your ability to adapt to technological changes, especially when the amortization period of your assets is taken into account. Long term rental offers the ideal solution to this problem: the exchange option. We will adjust the rent according to the value of the new equipment: if it is lower than the old one, your rent will be reduced. This way, you are able to adjust your equipment to your needs. In early 2016, Perfex was contacted by a company, from the Toulouse area, specialized in the space, military and aeronautics industry. Two of its departments had specific needs requiring modern and well suited equipment. The R & D department needed a high-precision imaging solution for data archiving, while the quality control unit was looking for a fast, ergonomic measurement solution. In both cases, they chose a long-term lease over a period of 3 years. For the former, the solution found was: a trinocular Huvitz stereo-microscope on a stand equipped with a 3 million pixel camera, a Photonic LED light ring and a Micrometric X-Y plate with a capture, measurement, and archiving software to control and make best use of the whole system. 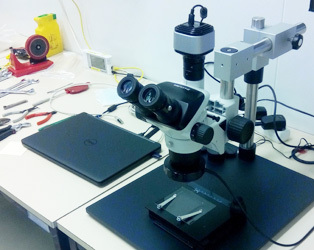 For the latter, a lighter and more comfortable solution was selected: A Perfex trinocular stereo-microscope on a stand equipped with a Tucsen TrueChrome-Metrics camera connected directly to a wide-screen TV allowing direct reading of the dimensions of the observed parts without using any computer and this in incomparable ergonomics conditions.